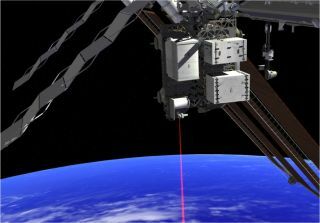 An artist's illustration shows the Optical Payload for Lasercomm Science (OPALS) laser beaming data to Earth from its perch on the International Space Station. NASA spacecraft may soon be able to beam their data home to Earth blazingly fast — with lasers! In space, a slow data connection means more than just annoyingly long video-loading times. It can cause frustration and mistakes on the International Space Station, according to a new NASA study — and it's forcing scientists to wait 16 months to get all the data back from the New Horizons spacecraft's historic July 14 flyby of Pluto. "If we wanted to do a Google map of the entire surface of Mars, it would take nine years to bring back all the data with the current radio-frequency system" when Mars is at its closest, said Don Cornwell, director of the Advanced Communications and Navigation Technology Division at NASA headquarters in Washington, D.C.
"The laser communication system that we're talking about is 40 times more bandwidth, which means that you could bring back that Google map of the complete Martian surface in nine weeks instead of nine years," Cornwell told Space.com. Cornwell also envisions using lasers to send HD videos to astronauts on the moon or more distant destinations, giving them instructions about how to fix a broken piece of equipment or treat a sick crewmember. A recent NASA experiment probed the effects of communications delays aboard the International Space Station by mimicking the gaps in communication that might happen during a crewed mission to a faraway destination. The researchers found that a 50-second communications delay frustrated space station astronauts and made it more difficult for them to complete tasks. Interviews with the crewmembers suggested that sending videos, and doing everything possible to cut down on the gap, could help lessen the negative impact. But sending more data at once can lessen the burden of that wait, NASA officials say. "There's a fundamental limit to radio frequencies," Matt Abrahamson, a navigation systems engineer at NASA's Jet Propulsion Laboratory in Pasadena, California, told Space.com. "The higher in frequency you go, the more bits you can pack into the transmission … And the next leap is to go optical." Going "optical" means communicating with laser beams of near-infrared light — a process that can send a stream of data 10 to 100 times faster than standard radio, according to NASA, and uses much less power than today's fastest, strongest radio signals. The near-infrared rays are not visible to the human eye. Abrahamson is mission manager for the Optical Payload for Lasercomm Science (OPALS), an effort to test a laser communications system between the Space Station and Earth. The system was built from off-the-shelf parts that hadn't been tested in space, but it still managed to aim and send a high-definition video down to Earth last June — a task that took 3.5 seconds instead of the 10 minutes it would have taken with the space station's radio-wave communications system. The task was especially challenging because of the laser beam's focused shape: As the space station moved at 17,500 mph (28,160 km/h), the system had to lock onto, and stay focused on, a laser beacon in California while transmitting the message. Whereas radio waves spread out in a wide beam, lasers are much more narrowly focused. And using lasers presents another challenge: When OPALS researchers zeroed in to communicate with the German Aerospace Center's ground station, a band of clouds thwarted their exchange. There are ways to overcome these challenges, though, and the pace of the technology's development on Earth has let researchers take it farther, for a lower cost. The researchers use the same wavelength of near-infrared light that Earth-bound companies use in fiber-optic cable, like the superfast Internet FiOS. Since the OPALS mission's early success, the team has tested the limits of the technology. Researchers found that the space station's laser signal can be focused into fibers one-quarter the width of a human hair, NASA officials said. A series of experiments has been testing the angles and strengths at which the beam could make it through Earth's atmosphere, and scientists are even using the system to measure how the space station vibrates. Cornwell, who managed that mission, said a laser system in development now that could communicate with a satellite around Mars would need a signal about 1 million times more powerful than LADEE's. And the farther out you go, the more of a challenge it will be to aim and decipher the results. "The laser beam that's going from Mars to Earth is so tight and narrow that little vibrations [on the spacecraft bearing the laser] can make that beam shake around and totally miss the Earth," Cornwell said. "It's the equivalent of when you're giving a presentation and you have a laser pointer, and you're a little bit nervous and people can tell, and it's very hard to point it where you want it to point because your hand has a quake to it." Plus, the beam has to point to where the Earth will be, once the light gets there — and the farther away a probe is, the more Earth will move during the light's journey. To receive the faint laser light, researchers would borrow time on a large telescope, like the 200-inch (16.7 feet, or 5 meters) one at San Diego's Palomar Observatory. New detectors, perfected in the last five years, can count individual photons of the laser light that make it back, and error-detection algorithms can descramble the signals to recreate the original bits. For near-Earth communications, adaptive optics systems can take out the "twinkle" and distortion in the signal caused when the beam passes through Earth's atmosphere. Currently, Cornwell said, researchers are on target to make a tested, space-ready system by 2017 that could link Mars and Earth by laser light at a faster data rate, and at a much lower size and power cost than a radio connection would allow. "We're so close to Mars — we have been for a decade — but we're leaving a lot of information on the table there that we're not able to bring back," Cornwell said. "We may be missing moments of serendipity where we might discover something, but we didn't see it because we never brought the data back; we never brought the images back." "Our sensors collect so much data out there today; we never had to deal with HD video being a data type that we've collected for science before, or high-rate imagery," Abrahamson added. "We have a tangible need to get it back to the ground." So far, no laser connection has been made farther out than the moon. But that may change soon: The systems needed to do so are in development, and NASA offered a $30 million incentive to include laser communications on the next Discovery-class mission proposals. Ultimately, laser communications technology could be humanity's best bet for extreme long-distance missions, advocates say. "The reason that lasercomm is better for distance is because radio beams spread out more, because they're longer wavelengths," Cornwell said. "If I'm trying to send it a far distance, the beam spreads out so much that I don't have a whole lot of signal that lands on my detector at the other end. But because a laser beam is so much more narrow and concentrated and focused at a great distance, I can deliver more signal power at a greater distance. I think we can communicate between the stars."